Need a road-trippin’ companion this summer? 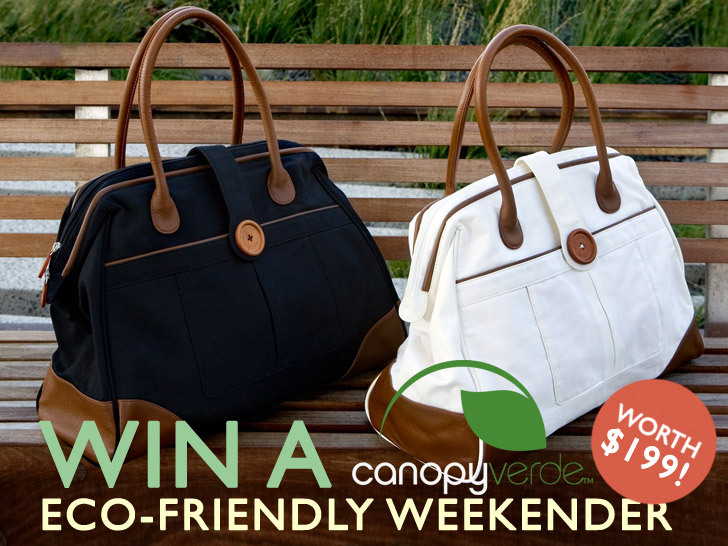 Travel shotgun with Canopy Verde’s “Cassia” weekender, a roomy carryall made from a sustainable combination of organic cotton, Oeko Tex-certified dyes, chemical-free embroidery, and chrome-free-leather and wooden accents. Inspired by the iconic doctor’s bag, with clean lines reminiscent of classic mid-century Danish design, this is one accessory that proves you can have it all and take it with you. Enter now to win one in your choice of black or white! 3. LEAVE A COMMENT BY APRIL 30 and tell us how you celebrate Earth Day every day. Although it doesn’t hurt to get fancy, we’ll be picking a winner at random. We’ll announce the winner in our newsletter on Wednesday, May 1. The deadline to enter is 12 midnight ET on Tuesday, April 30, so ENTER NOW for a chance to win! Originally published on April 18, 2013. We always try to recycle as much as we can. When we see trash laying on the ground we pick it up. Every Earth Day, my friends and I do a clothes swap. It's actually a lot of fun. We organized it for our high school during our senior year, and it's been an annual tradition since then. We respect the Earth everyday by many ways, Being vegan is one of those ways. Bless! It is the way of my life to respect the Earth. Being vegan helps everyday! Bless! I celebrate Earth Day every day by considering the environmental impact of almost most decision I make during the day. Do I want coffee on the coffee run? No, because I have a reusable mug and a coffee pot in my office. Do I need that adorable skirt on the sale rack at the mall? No, because it was likely made far away from here using questionable chemicals and materials. Should I just throw away this (insert no-longer-useful household item here)? No, someone might be able to use it so I'll Freecycle it instead. This pause to consider the environmental impact of the decision has also saved me money and helped me live more simply. So, do I really need a new weekend bag? No, I can get by lugging stuff in my current assortment of smaller, mismatched bags just fine. BUT, I would feel really nice and probably much less sweaty arriving at my destination with one appropriately sized bag! One or more of our local junior colleges sponsor Earth Day fairs. I like to stroll and look at all the displays. Lots of new things and ideas. Doing shopping on weekdays I simply take a backpack and that's it; no need for plastic bags. By supporting my university's earth day festival by volunteering! Celebrate earth day every day by being a vegan and driving a hybrid vehicle. I celebrate Earth Day every day by teaching others how to live a greener life. By recycling and taking my own bags to the store! I celebrate Earth Day everyday by promoting green lifestyles and helping others to recycle/upcycle more. Over the last year I have been working on making significant changes to the lifestyle of not just myself, but my whole family. We have greatly reduced our trash output but using reusable containers and making many store bought items at home. I have begun walking or riding a bike to run errands rather than use my car. I have been finding recipes and making my own skincare products from natural ingredients and sharing them with friends to get them to start doing it as well. Finally, my husband and I are re-landscaping our backyard to create an organic kitchen garden and learning how to use natural methods to combat pests and teach our son as we learn ourselves. I celebrate Earth Day daily by encouraging others to maintain and sustain the environment through local clean up efforts, and by following the "reduce, reuse, recycle" motto. We celebrate Earth Day every day by growing our own veggies and greens. Since we're so lucky that Earth Day is in the Spring, I plant a vegetable garden with my daughter every year. We love it! We spent the day gardening. We celebrate earth day every day by teaching my children to love and erspect the earth and leave as little as a footprint as possible! I celebrate Earth Day every day, by loving nature and being an environmental advocate. Currently working on the Fossil Fuel Divestment campaign at Syracuse University to make efforts to make our world less dependent on fossil fuels! There are so many ways I celebrate the earth daily - from recycling everything possible to just enjoying and participating in natures beauty and bounty through gardening, biking, etc. As a volunteer with Teens Turning Green, I help spread the green message and educated youth on how to live eco-consciously, in particularly through social media. I also try to spend as much time outside, so I never lose sight of its pure beauty + healing powers. Everyday is Earth Day. It comes naturally to me to live like everyday is Earth Day. I celebrate Earth Day every day by waking up and glancing out my window and thanking the universe for supplying us such a beautiful place to live. Then I try to make a conscious decision every day to love what has been given to me, cherish what has been granted to me, and share the knowledge that has been bestowed upon me. I try to be Green in my everyday life and celebrate Earth Day by being gentle with nature. My family has been a steward of the Buckeye Trail for over 30 years and I've instilled the reverence for nature in my kids. I've started a window garden this summer - currently growing all sorts of herbs and veggies. I not only water it with dirty water, but I'm also planning on distributing the produce to my friends! :) Yay for urban farming! Make an effort to pollute as little as possible. Recycling most things. Making little trash. I tried to recycle as much as I could. I celebrate Earth Day every day by keeping monitoring my resource usage and finding ways to reduce and reuse. I try to buy locally, look for products with minimal packaging, and choose to do business with companies that have a focus on sustainability and conservation. I celebrate Earth Day every day by monitoring my resource usage and finding ways to reduce and reuse. I try to buy locally, look for products with minimal packaging, and choose to do business with companies that have a focus on sustainability and conservation. To celebrate Earth Day every day, I make sure I only use reusable bags, cups, straws... reusable everything! This is a great bag! I would love to win. Getting my produce from a local organic farm through a CSA share! I celebrate Earth Day every day by always considering how my daily acitivites may affect the environment: am I using too much water in the shower? Did I use a bio soap in the dishwasher? Did I line dry as many clothes as possible? Did I get as much in the recycle and organic recycling bins as possible? Reconsidering and reminding yourself every day is the best way to celebrate the Earth every day!. I "Like" Canpoy Verde on FB and am a newsletter subscriber! Everyday is Earth day! I go recycle everyday and try to paperless and subscribe online newspapers, I make the best and full use of all my water. we're starting a garden this year, trying to buy locally farmed produce and handmade rather than machine-made items. I celebrate Earth Day every day by composting the organic matter from my kitchen to help feed the soil at the farm I get my CSA through! I celebrate Earth Day every day by recycling everything we can - we even have recycle containers in our cars. We also reuse things like boxes and jars when we can and we recently planted a garden in our backyard. I am an environmental consultant and each day I celebrate earth day through my profession. However, on the day in particular, I try my best to share, tweet, talk to people about sustainability and the challenges that lie ahead. I recycle everything possible and buy organic and/or local foods. At the office, I've been known to take soda bottles and cans out of trash bins and put them in the recycle bin. I do the same things I do everyday to take care of the earth...recycle, reuse, and make homemade items. I usually wear green and if its nice, take the kids outside and we clean up the yard...they love picking up sticks/pinecones! I celebrate Earth day by walking somewhere new, which playing Ingress is encouraging. I also turned over my compost pile extra vigorously and delivered some material I can't process to my municipal organic composting yard here in Yonkers. By recycling every thing we can! I like them on facebook where I am 'Margot Core'. I subscribe to Ecouterre to this box: margueritecore [at] gmail [dot] com Earth friendly-wise I am the master composter - every single day! I always turn off my lights and power cords when I leave my place. On Earth day every year I plant a tree. i try to make earth day everyday by living more simply. we're gearing up to downsize our footprint and living space by moving into an eco renovated airstream. i hope to teach our children that we can be stewards of the earth no matter where we live or how much we have. Everyday is Earth Day! I drink out of re-usable water bottles, I recycle and I just built raised beds for an organic vegetable garden :) I am going to start composting and I avoid buying genetically modified food which I think is seriously harming the environment and killing all the bees. I have volunteered for GMO Free Oregon which is working to educate people about GE food and trying to get it labeled and/or banned in Oregon. I turn the lights out when not needed. We take shorter showers and recycle. We recycle gallon milk jugs and lids and get them refilled with fresh milk at the farm next door. I live off the grid in Hawaii ,have an organic farm and create sustainable fiver apparel from my home studio! i celebrate earth day every day first, by being grateful & in awe of this gorgeous & wondrous world. i don't own a car, don't use paper products, borrow & lend whatever possible instead of buying, make my own cleaning products, and look for ways to reuse whatever i can. i recycle and garden on my city window ledge & fire escape. Everyday is Earth Day in our home, not that we do not participate in the annual celebration of our planet. We have had a vegetable garden since we first married 41 years ago. This year, at our current home, we planted fruit trees, and berry bushes. We have always put food up for the winter, and canned fruits and vegetables. We grow our own herbs, and always look for new recipes and ideas. For instance, we will soon be adding an outbuilding to our property that will serve my husband as a workshop, I have plans to use SOLAR PANELS to provide power for his electric tools and light the building, a part of which will serve me as an art studio. Our front lawn is mostly made up of MOSS, we were told that we were blessed to have it, and to 'feed it' with buttermilk so that's what we're doing, feeding and growing a Mossy front yard. It's beautiful. My next dream is to get an electric car. I always bring a reusable shopping bag with me; no need to take home a disposable bag when I go shopping! We recycle, reuse, donate, use the site that trades for items needed so I give a lot to people who ask for items that I no longer use, our yard is all planted to be mostly self sustaining for this area so we don't have to water it, or have yard clippings put in the waste, they are used for mulch. We hang our laundry out to dry in the air. There is a lot we do that would take me a lot of time to list and I am not an organized thinker lol. I celebrate Earth Day everyday by using organic and natural cleaning product. Besides that, I also use home filtration system instead of plastic bottles. i recycle and reuse everything possible. I celebrate Earth Day every month by planting new fruits, vegetables, and/or flowers in my garden. For earth day each year we work in our garden finding as many ways as possible to recycle pots, decor and plants among our friends and family. We recycle almost everything and take the bus several days a week instead of driving our car. We try to use what we have and donate what we don't need. I recycle daily, carpool, and shop locally when possible. I celebrate Earth Day with the Girl Scout troop I lead. The kindergarteners are always enthusiastic. My family celebrates Earth Day as if it's Christmas, but instead of giving each other presents, we give presents to the Earth. We make and spread seed bombs, plant trees, flowers, plants, clean up local parks or our neighborhood, talk about what people can do to help save our planet to our friends, neighbors, class mates, etc. I celebrate Earth Day everyday by being vegan! i make a point of noticing and really soaking in nature whenever possible. i take pics and store them digitally except for the handful i print on kodak paper. i shop weekly at farmers markets. I am about to depart to Florence Oregon to visit my friend Audrey and together we will plant a tree. I recycle at home, always compost, have made wheel barrows full of dirt as have a large screen and screen out my aged kitchen and yard compost into wonderful earth. I celebrate Earth Day every day, by recycling -- bring all recyclables to bins at shopping centers etc.,compost at home, use native plants only for decorations in yard. I recycle as much as I possibly can - even my K-cups! A little over the top? Maybe, but every little bit helps. On Earth Day I try and plant a flower. I do other things year round - compost, recycle, ride my bike, eat plant based etc. But just a flower is a nice smile for many people. I look for ways to spread beauty and appreciation for the natural world around us. I celebrate Earth Day everyday be composting, car pooling, recycling, re-using, using less water, using less paper & plastic products. I celebrate Earth Day everyday by recycling, re-purposing, reusing, growing some of our own food, buying more organic products, buying things with more recycled materials used, and trying to make my live and surroundings more green. I'm signed up for the Ecouterre newsletter and I like Canopy Verde on Facebook. We celebrate Earth Day everyday by doing our best to protect and enhance the earth. We recycle, reuse and repurpose; we garden; do laundry in cold water; and use energy efficient appliances when possible. I reduce, reuse, recycle, buy organic food and products and shop at fair trade places! I eat a vegan diet, use reusable shopping bags, and pick up trash that I find on the ground (This gets me some strange looks, but it doesn't feel right to leave it there). I bike and take public transit everywhere I go - no car!...reuse and recycle just about everything, shop second-hand and local, grow my herbs, AVOID plastic, contribute $ to environmental charities, and eat VEGAN :))) Most importantly, take a step back to thank the earth for having us! Sustainability and eco-friendliness are both essential ingredients to my lifestyle. As a Californian, I grew up being taught that recycling and water conservation were important aspects to living. I was also taught to respect the Earth and all of its inhabitants. As time has passed, my admiration for these teachings and their wisdom has only grown. Now, as an adult, I take recycling very seriously, and recycle all that I can. I also conserve water, try to mostly shop for eco-friendly products, thrift shop, upcycle, use public transportation, educate my peers about environmental concerns, and donate to wildlife charities. Every day I do all that I can to help our home � Earth � and I hope many more will learn to do the same. We switched from disposable diapers to cloth. As an environmental journalist, I celebrate Earth day everyday by sharing my love of everything good and green with my readers around the world. We recycle, compost, and use reusable grocery bags. The kids and I clean up the trash along the road every Earth Day, and are now used to picking up, and not ignoring, trash on walks, or at the beach. I celebrate Earth Day everyday by not owning a car! I've been a dedicated cyclist commuter since 1993! Every day is Earth Day! We use cloth napkins, reusable bags and recycle whenever possible. Being an artist I also try and reuse materials in my art and jewelry when possible such as old shoes, clothes, purses, cardboard from packaging. I try to buy all organic food & natural body products, recycle, use reusable shopping bags, buy local at the farmers market, etc, etc! I celebrate Earth Day everyday by eating consciously, giving thanks to mother earth, buying locally, and buying secondhand and handmade items that support conscious people and causes! I turn off lights, drive as little as possible and volunteer at the local CSA. We try to pick up trash that others have left behind when we're at parks or in town. I always look for local Earth Day celebrations in my town to participate in! Need a road-trippin' companion this summer? 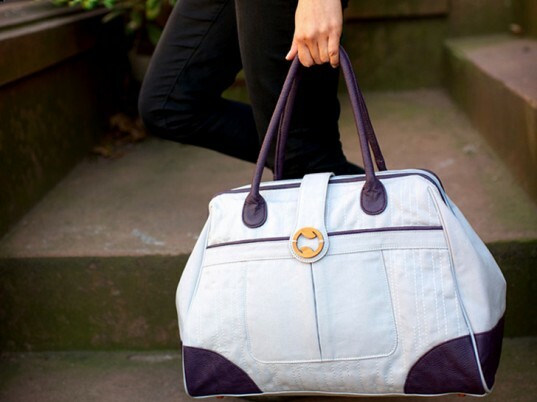 Travel shotgun with Canopy Verde's "Cassia" weekender, a roomy carryall made from a sustainable combination of organic cotton, Oeko Tex-certified dyes, chemical-free embroidery, and chrome-free-leather and wooden accents. Inspired by the iconic doctor's bag, with clean lines reminiscent of classic mid-century Danish design, this is one accessory that proves you can have it all and take it with you. Enter now to win one in your choice of black or white!